"Poor Andy. Dolores is going to have a birthday party on Halloween and Andy has to go. Things get more interesting when Andy and Dolores hatch a plan to catch the culprits who have been smashing Dolores's and other people's pumpkins. Andy's final trap not only catches the perpetrators but also ends up being an extra-special present for Dolores. Rachel Lillis reads Jennifer Richard Jacobson's short chapter book (Candlewick, 2006) for beginning readers. While it would have been nice to have a male narrator since the main character is Andy Shane, Lillis performs well. Some sound effects are difficult to distinguish or too short in duration. These minor quibbles aside, this is a solid purchase for any time of the year, and especially for Halloween." "Andy Shane is reluctant about attending the Halloween birthday party of his classmate, Dolores Starbuckle. But when his grandmother becomes involved in the party planning and when pumpkins are being mysteriously smashed, Andy is lured in and makes a good friend. Rachael Lillis's narration captures the essence of the young neighbors. As Dolores, she narrates with a bossy edge; as Andy she schemes eagerly and pouts readily as crime-solving plans fail. Lillis creates a unflappable, matter-of-fact voice for Granny Webb. Leisurely pacing enables listeners to absorb the action and anticipate Andy's next moves. Sound effects such as "wooing" ghosts and cascading marbles underscore important moments in the plot." 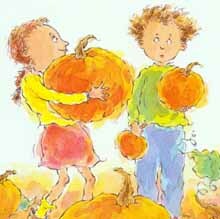 "Lillis offers a fun, high-spirited reading of Jacobson's lighthearted story, which finds Andy Shane joining forces with bossy Dolores Starbuckle to outwit some pumpkin-smashing tricksters. With crystal clear diction and a smile in her voice, Lillis skillfully reads the comical tale at a brisk pace. She excels at characterization, deftly portraying the often-bewildered titular hero and his dignified, raspy-sounding granny as well as squeaky-voiced Dolores. Lillis does particularly well during amusing scenes in which the two friends elaborately plot their revenge and pretend to be moaning ghosts to scare the villains. Evocative sound effects and bouncy music enhance rather than overwhelm the narration. This enjoyable friendship story is perfect for Halloween but is an entertaining treat at any time of the year."